The 10MA crew at AASP ’12. 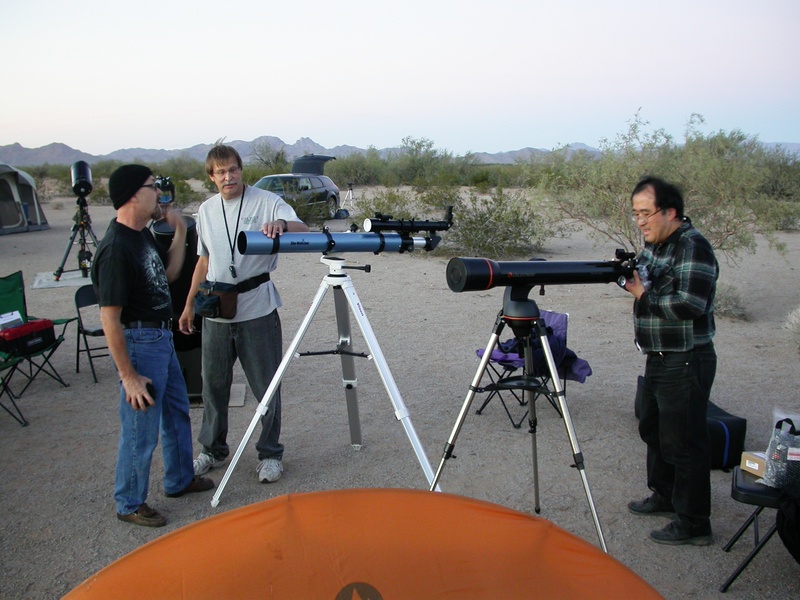 From left: me with my XT10, David DeLano with his SkyWatcher 100T, London with his AstroScan, and Terry Nakazono. 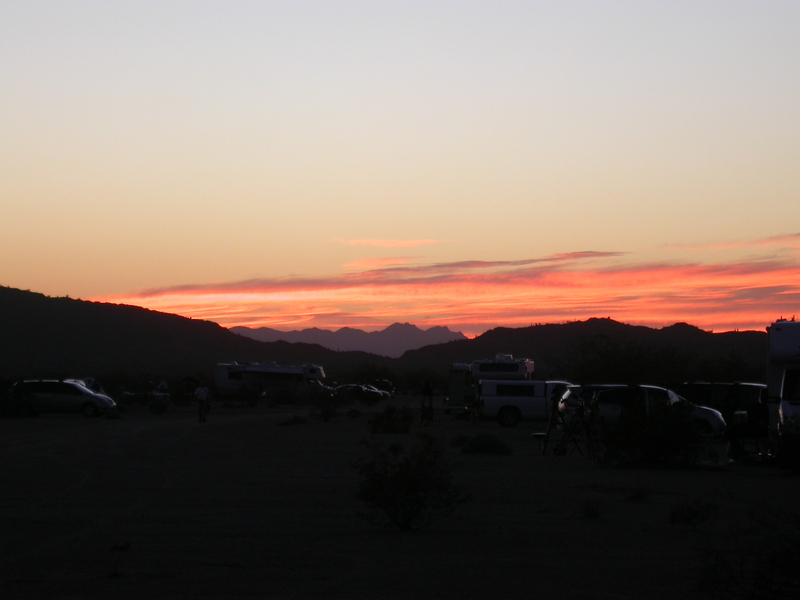 Last Saturday night London and I were out in Arizona for the 2012 All-Arizona Star Party. 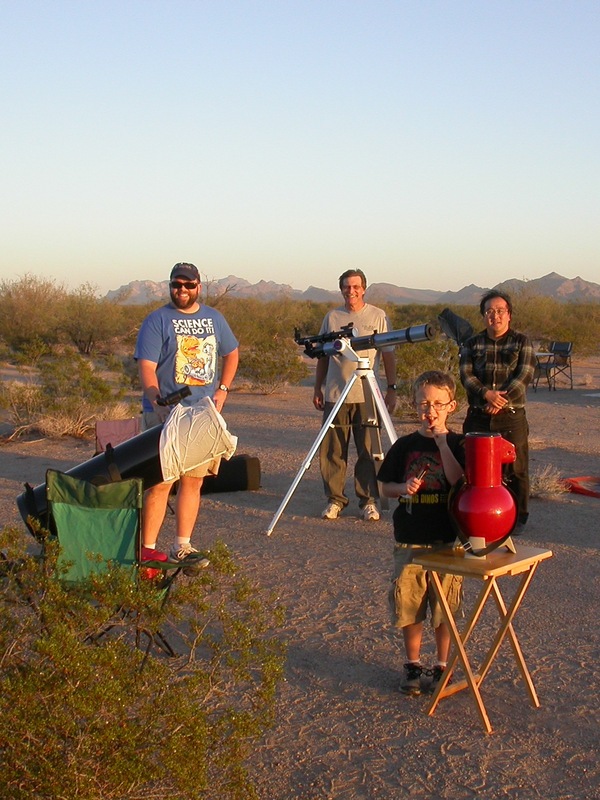 We’d been to the 2010 AASP–one of the finest nights of stargazing of my life–but we missed it last year, so it was great to get back out there. Terry Nakazono went with us. It was our third time observing together after a couple of Mt. Baldy runs this summer, and our first time under truly dark skies. Happiness is a new scope under dark skies! The big news for us was meeting frequent 10MA commenter David DeLano for the first time. David and I have been email pen pals for a couple of years now, and he’s written a couple of guest posts (sun funnel and diagonal comparison) but we’d never met in person before this weekend. He’s not unusually happy in this picture–in my admittedly limited experience, his grin is as much a feature of his face as his moustache. But he is pretty darned happy, because he was rolling with his dream scope this weekend, a 4″ f/10 SkyWatcher triplet apo that he’s owned for just a couple of months. This was only his third or fourth time using it, and the first time under dark skies. Terry’s new Celestron NexStar 102GT–a.k.a. the Costco Scope. Photo by Terry Nakazono. 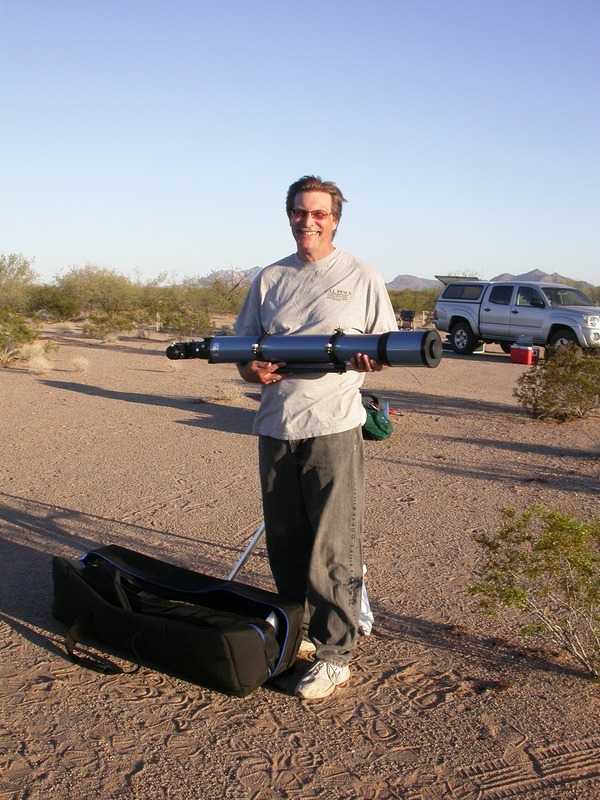 As luck would have it, Terry was also rolling with a new “big gun”, and it was also a 4″ f/10 refractor. His is an achromat, the Celestron NexStar 102GT, which he acquired even more recently. He calls it the “Costco Scope”, because apparently this particular package of scope and mount is only available in Costco stores. It’s a 4″ long-focus achromat on a fully motorized GoTo mount for $200 even, which is probably one of the best deals in telescopes right now. Terry showed me Barnard’s Galaxy and IC 342, another faint galaxy, through this scope, and I can confirm that it both pulls down the photons and gives a nice crisp view. Loaded for bear. The padded grocery sack on the left covers the end of the XT10 so it doesn’t get dinged when I close the hatch. Photo by Terry Nakazono. 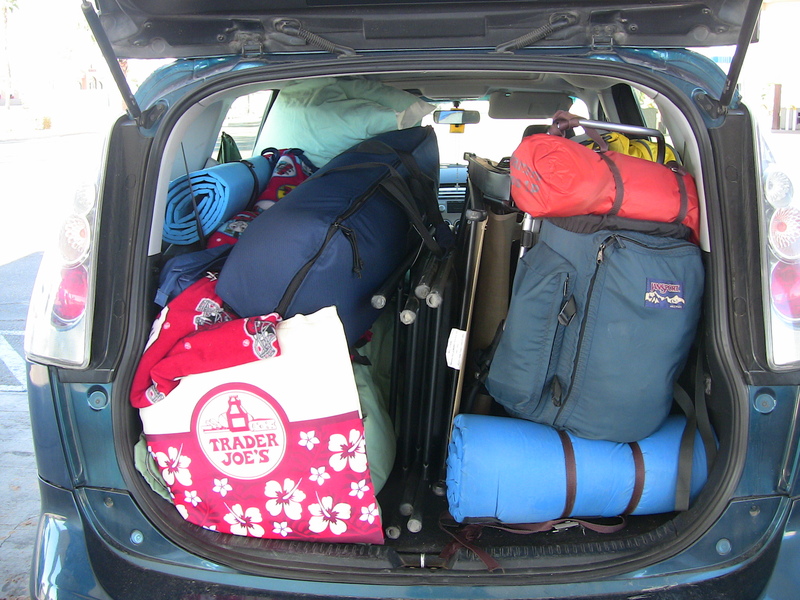 With Terry’s new scope and tripod–not to mention his tent and the rest of his gear–London’s AstroScan, my XT10, assorted camp chairs and sleeping bags and backpacks and water bottles and so on, our Mazda 5 was packed pretty full. Terry snapped this pic when we stopped for gas in Blythe. The AASP was not just a chance to hang out with new friends but also to catch up with an old one. 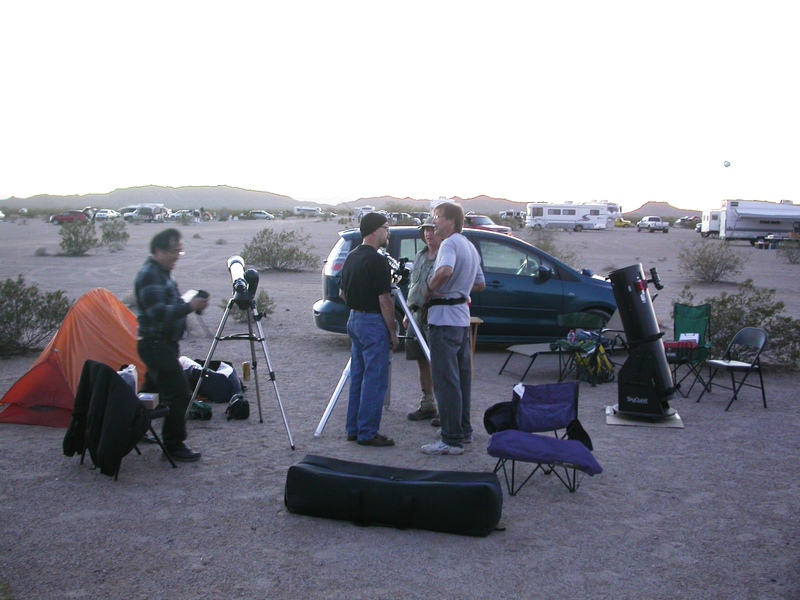 I hadn’t seen Darrell Spencer (on the left here, checking out David’s SkyWatcher) since the 2010 AASP, although we’d emailed back and forth a few times. It was great to see him again–and kinda funny, too. Not much had changed. He was rolling with his 11″ Celestron SCT and I had my XT10, just like last time. He was working on the Herschel II list and I was chasing Herschel 400 objects, just like last time. He’s closer to finishing his list, though, with only 25 or so objects left. Meanwhile I’ve just barely passed the 150 mark on the Herschel 400. Darrell was already set up when we rolled in, and he invited us to set up to the south of his camp. Next to him was Jimmy Ray (just visible here between Darrell and David), who quickly hit it off with our crew. Darrell and Jimmy also shared their experience with us, which was a real boon, especially for Terry as he was still learning the ropes of his first GoTo scope. Oh, about that GoTo scope. Up until now Terry has been working almost exclusively with tabletop Dobsonian reflectors. His first scope on getting back into astronomy in the past couple of years was an Orion Funscope, and his most-used scope is his SkyScanner 100 (see his review here). With the SkyScanner 100 and more recently a StarBlast 4.5, he has logged over 400 deep-sky objects, mostly galaxies. To put this into perspective, in five years of stargazing I have observed perhaps 350 deep-sky objects, mostly with a 10″ scope. So it’s quite an achievement, and one I hope I can convince Terry to write up as a guest post. Anyway, my point is that going from small reflectors with no electronics to a big GoTo refractor is quite a change of pace. I asked Terry how it came about and he pointed to two major factors. First, the scope is a heck of a deal and he was curious about it. Second, and more importantly, after logging 400 DSOs by starhopping with small reflectors, he felt he had earned a break. I couldn’t agree more. 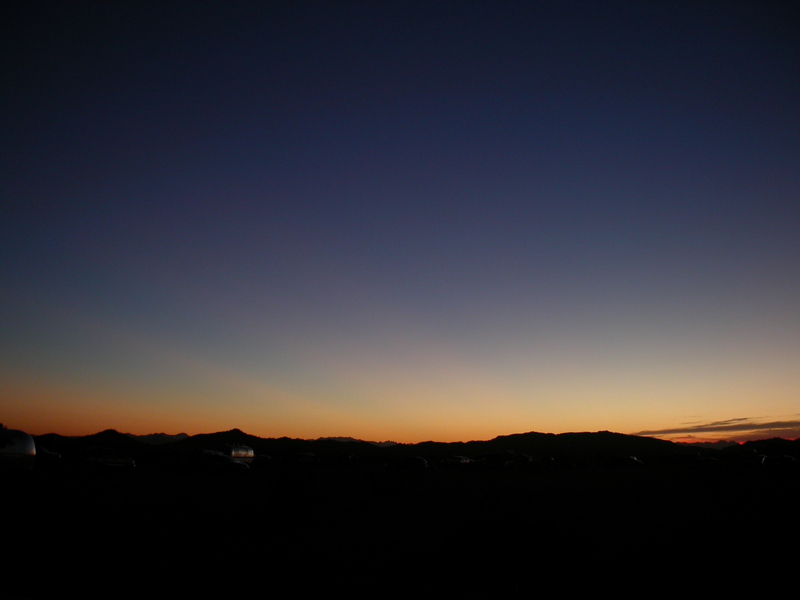 A few low clouds skirted the western and northern horizon around sunset, but they didn’t last, and the skies were cloud-free all night long. Transparency was good but not incredible. Jimmy said he could see the Gegenschein and pointed it out to Darrell and me, but neither of us was fully convinced. I’m not saying Jimmy didn’t see the Gegenschein, but I didn’t see anything I felt comfortable calling the Gegenschein. That could be inexperience on my part, and it could be imperfect vision, too. London regularly sees things in the sky that I just can’t make out. But it was also at least partly imperfect transparency. 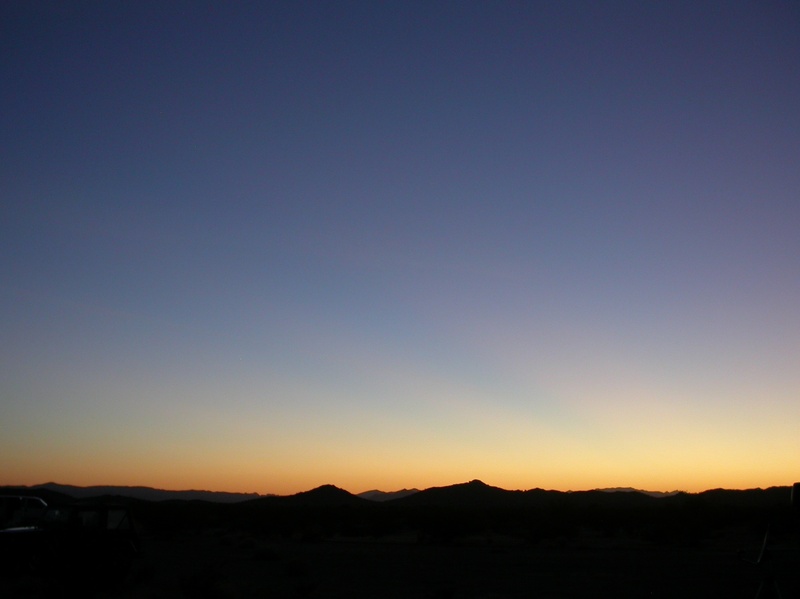 The western sky was striped with delicate crepuscular rays after sunset (also just like last time). One of my major goals for the night was finding and sketching comet 168P/Hergenrother, a dim periodic comet that unexpectedly brightened by a factor of 100 recently. It’s a tough catch from town–earlier this week I caught it from my driveway with the XT10, but only by waiting until it was high in the sky, knowing exactly where to look, and using averted vision. But under dark desert skies it’s dead easy, and shows a bright nucleus and wide tail even at low magnification. Comet Hergenrother is also moving at a decent clip–as the sketch shows, it moves visibly in the space of an hour. I found the comet by sweeping northeastern Pegasus at low power, and sketched the field without taking the time to figure out exactly where I was. I thought I could work that out later, using Stellarium, and I was right. The right part of the above image is a screenshot from Stellarium, inverted and annotated in GIMP, to show the field of the comet. Hergenrother is still visible–check Heavens Above or google ‘comet Hergenrother chart’ for finder charts. Update: the best Hergenrother charts I have found so far are at Skyhound and AstroBob. The Skyhound chart covers more days, but the AstroBob chart goes deeper, and those dim little stars are clutch if you’re trying to find the comet under less-than-perfect skies. The Heavens Above charts are great but AFAICT they only show the position of the comet right now, so there is no provision for printing out a chart for this evening (and the comet will have moved in the meantime). I chased the comet, I traded views with my fellow stargazers–including London, who found the Pleiades by himself with his AstroScan–and I hunted down a bunch of new Herschel objects. But my favorite views of the night were the unexpected ones. First were the meteors. Holy smokes did I see a ton of them. I lost count around three dozen. 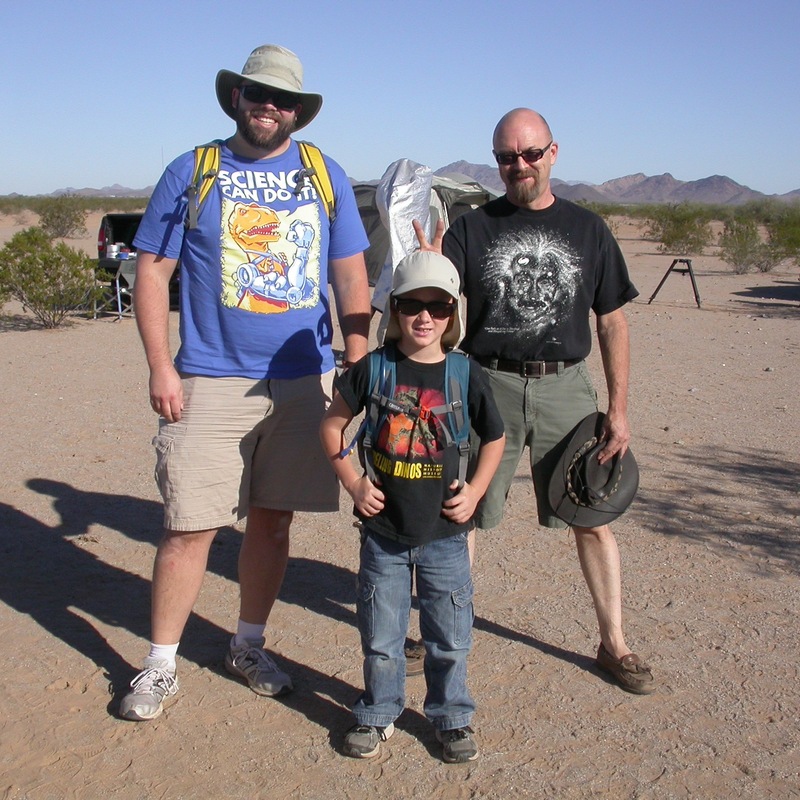 One of the best came when Terry and London and I were walking David to his car–a brilliant meteor shot across the western sky and left a glowing trail that slowly faded. I almost missed the best meteor of the night, though. Around 1:30 in the morning I was looking down to check my charts when I saw bright light flashing in my peripheral vision. I looked up in time to see a fireball shooting straight down toward the northern horizon. It was so bright it cast shadows on the ground–something I had read about but never seen before. Update: David pointed out via email that the Orionid meteor shower peaks this weekend, and the meteors we saw last weekend were probably advance scouts from that swarm. From midnight to 1:00 AM I took a little siesta. I reclined in the lounge chair with my 10×50 binos and split my time between dozing, scanning with the binos, and just looking up in wonder. The Milky Way shone from one horizon to the other like an arch supporting the dome of the heavens. But ironically it was the “dome of the heavens” I was trying to escape. I haven’t talk much with others about this, so I don’t know how common it is, but for me one of the hardest things about space is perceiving it as space. It is very, very easy to look up and see the sky as a dome set on top of one’s little patch of the Earth like a bell jar. It is much harder, for me at least, to keep in mind that it is three-dimensional, that the stars are not points stuck to the dome or to a celestial sphere but free-floating lights–no, impossibly distant suns–hanging unsupported in…nothing. In space, or in spacetime, which is harder to think about but amounts to the same thing. One thing that I find helps me in trying to escape the tyranny of the spherical sky is to imagine that I am looking not up, but out, or even down. It works best if I lie down with my feet pointing south, and imagine that I am hanging off the side of the Earth like a picture on a wall. 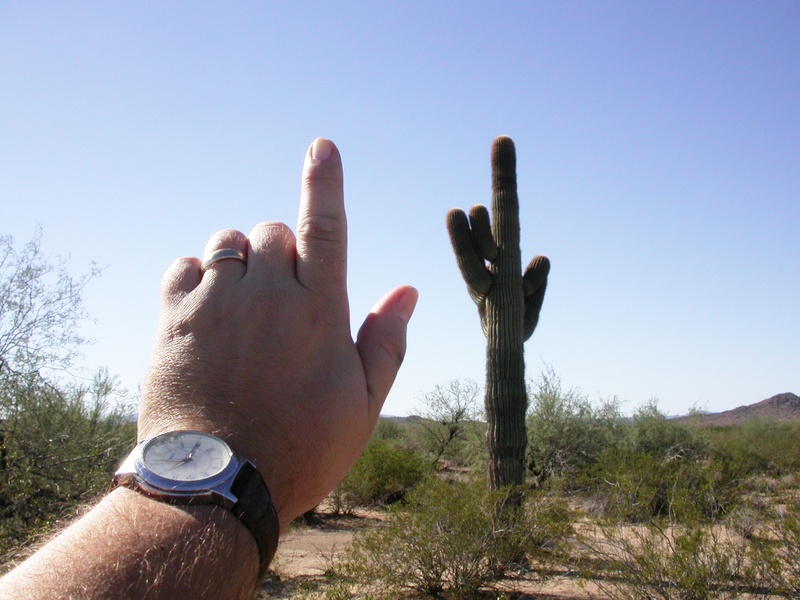 I used to do this in the front yard of my parents’ house, under radically dark rural Oklahoma skies, and to enhance the illusion I would dig my fingers into the dirt to keep from sliding off. When I tried it Saturday night I managed a mental 180: for a few minutes I fooled myself into thinking that I was hanging facedown, with the whole Earth above me like a great balloon tied to my back, staring down, down, down. Down forever into a great cosmic gulf in which the stars and clusters and galaxies were distributed at different depths, unevenly, like coral reef fish seen by someone snorkling at the surface. I wanted to let go, cut the balloon string, and fall into those distant deeps. Eventually I came back down–or was it back up?–went back to the telescope, and got back to work. But the aftereffects of my perceptual voyage into deep space–really deep, fall-into deep–lasted like a slight electrical charge, a pleasant tingling in the brain. The next time you’re outside under dark skies, try it and see where you go. I pushed through to about 4:30 and then crawled in the back of the Mazda for a few hours’ rack. By about 8:30 it was too bright and hot to sleep anymore so I got up, got some badly-needed caffeine on board, and went about the day’s business. Which on the morning after a stargazing run with London means a hike. 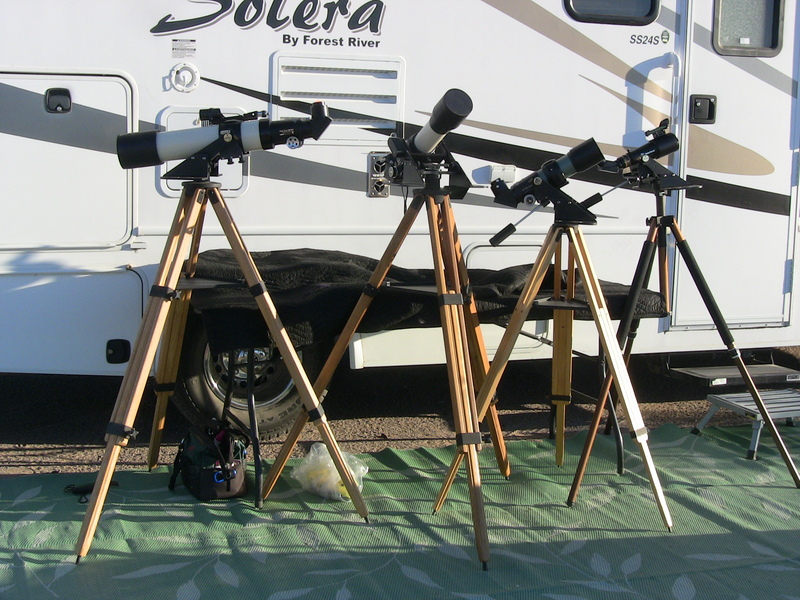 A nice lineup of TeleVue refractors. From left to right, I think they are a TV-101, TV-85, TV-76, and TV-60. With mounts, this is probably $10,000 worth of equipment. Photo by Terry Nakazono. On our way through camp we got to peer at other peoples’ scopes, in the manner of nosy neighbors. This lineup of TeleVue refractors was certainly droolworthy. 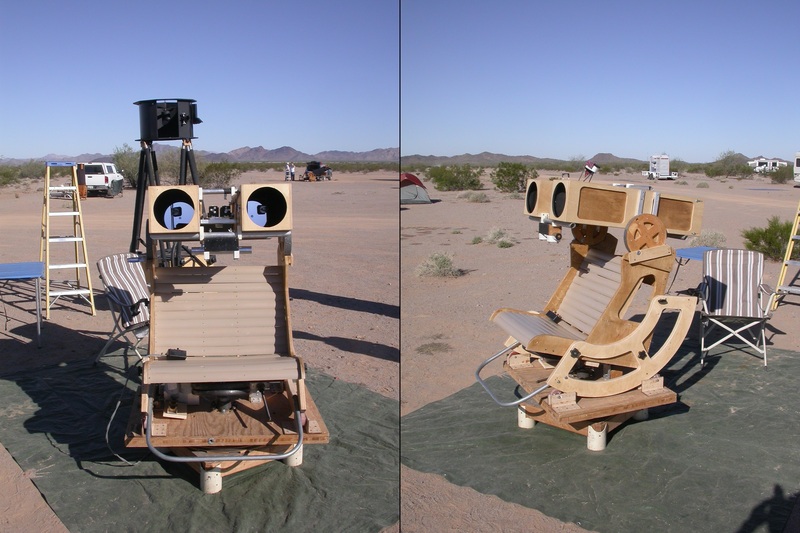 Of the many cool scopes we saw, my favorite was this homemade motorized binocular chair. The twin 6″ reflecting telescopes feed light to the eyepieces. The scopes can raise and lower as the observer raises and lowers his head, and the whole chair turns and reclines at the observer’s command thanks to a hand-held control paddle. 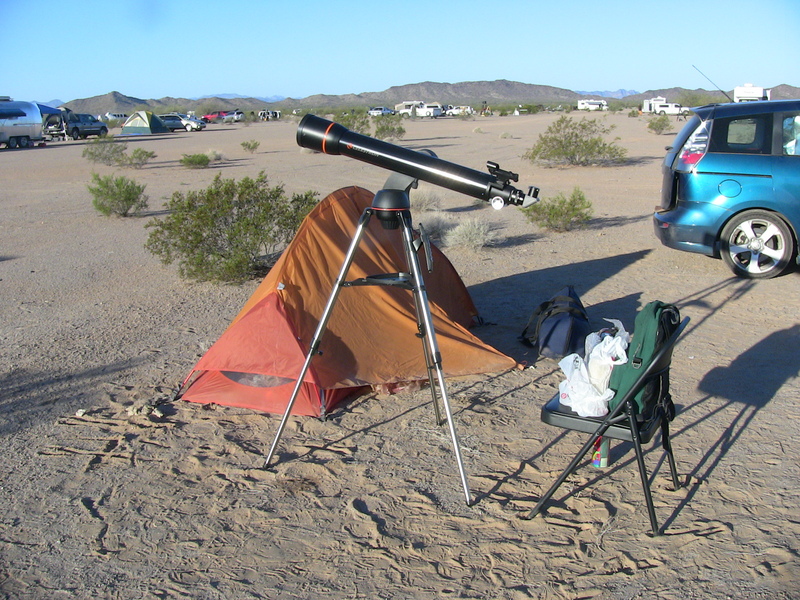 Given my love of binocular astronomy, something like this might be my ultimate observing setup. 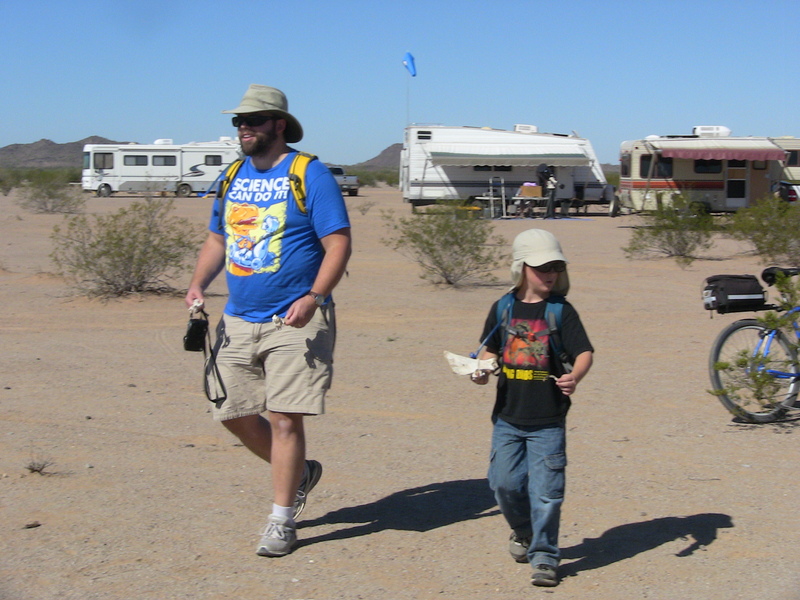 We didn’t have as much time for our hike as we did in 2010. Then we walked about five miles all told, over about three and a half hours. This time we had about an hour and a half, but we still managed to cover a lot of ground and see lots of cool stuff. Back from a successful “bone hike”. Photo by Terry Nakazono. At the 2010 ASP London was about a week shy of his 6th birthday. When we started out on that hike, he announced that it was going to be a “bone hike”. 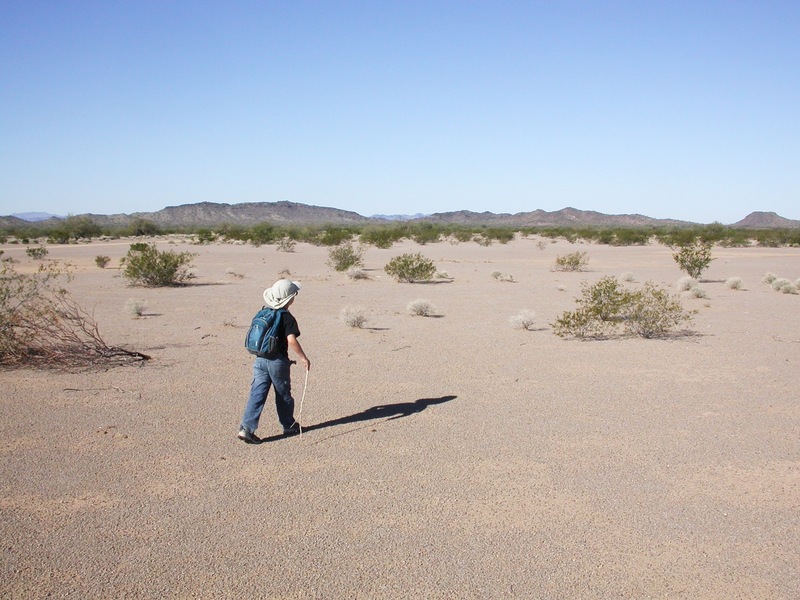 I didn’t have the heart to tell him that you can’t just decide to walk out into the desert and have any guarantee of finding bones. I figured we’d get what we’d get, and I’d break the tough news later if it became necessary. As luck would have it, it wasn’t–one of our first finds, just a few hundred yards from camp, was a big fragment of a cow tibia. This time London knew going out that we’d probably get skunked, and it certainly looked like we would for most of the hike. But on our way back, within a stone’s throw of the closest RV, we started seeing the clean bright white of sun-bleached bone. We picked up a shoulder blade and parts of three vertebrae, perhaps from the same cow that lent us its tibia two years ago. We left behind a couple of ribs and another shattered vertebra for the next people to pass that way hunting for bones–possibly our future selves, if nothing turns up sooner on our next AASP morning-after bone hike. 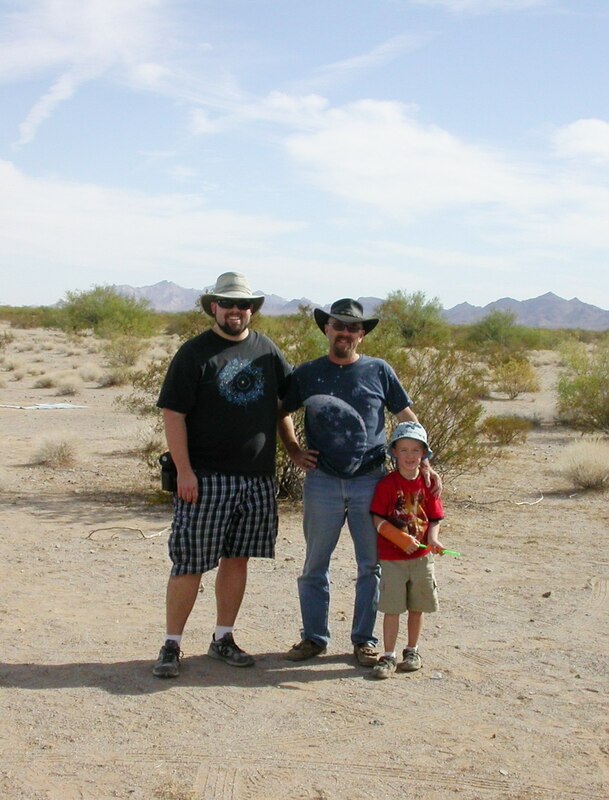 I’ll end this post like I ended the last AASP observing report, with a photo of Darrell and London and myself, standing on a dusty abandoned airstrip in the exact middle of nowhere–a seemingly unremarkable spot that has become one of my favorite places on Earth. 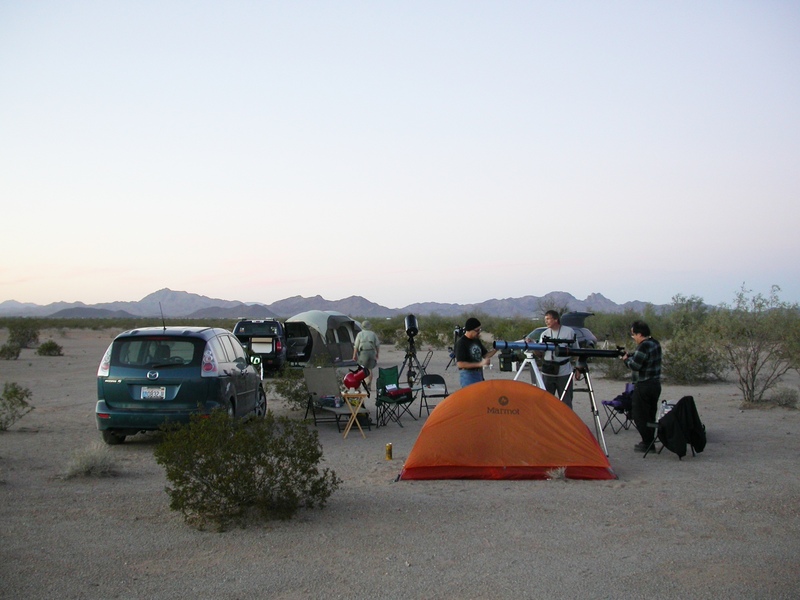 I’m already looking forward to my next Arizona star party. I hope I don’t have to wait two years to get back. Wow, I need to get me one of those binocular observing chairs! Regarding the NexStar 102GT “Costco” scope, it was my observing friend Darren who first notified me about it three weeks ago. The day after I got his email notice, immediately after work I went to the closest Costco I could find, bought an annual membership card and snapped one up! I was interested in seeing what a 4-inch, long focal length achromatic refractor could do, but had no idea what to expect regarding the GOTO mount, since the thought of using one never crossed my mind up to that point. Now that I have one, I’m looking forward to spending more time actually observing and sketching objects rather than just finding and tracking.them down manually. I’ve recently acquired a Costco Nexstar 102GT and it inspired me to finally set about creating a design for simple adjustable wooden replacement legs for this and similar scopes; I’m building it this weekend and I’ve posted details on my own WordPress blog: http://astrosetz.wordpress.com. PS: I LOVE the use of the wooden TV tray and the chair for the Astroscan! Never thought about using either, but makes total sense. This is a wonderful post, Matt! You’re writing and photos always leave me wanting more!